It is faster than some others and with the soft chines very forgiving for beginning and intermediate paddlers. Larger than its younger cousin the Outrage, it is capable of self supported trips and is better than others for those big water runs like the Grand Canyon. In 1971, canoeist Jim Henry won the National Downriver Championships in a boat he built himself, and the Malecite and Mad River Canoes were born. A couple of decades later, Henry and fellow paddler Tom Foster designed the Outrage and a bigger cousin, the Outrage X as high performance solo playboats. 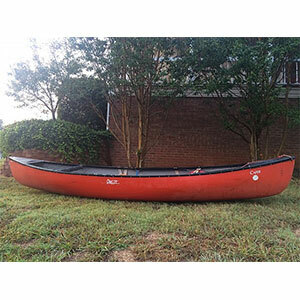 Like most other canoes designed for rugged use, they were and are available in Royalex, a durable plastic made from a sandwich of vinyl, foam and ABS.When they were designed, they were smaller than most solo playboats at 12 feet and 13 feet in length. They also had a high degree of rocker. Most importantly, they were fast. Today, though there are many newer designs, they are still popular boats. The Outrage was designed for paddlers under 175 pounds. My son, Ned, in an Outrage. The soft chines are less catchy than a harder chine making this situation more easily recoverable with a high brace. Knowing that some paddlers are heavier than that or a lighter paddler might want more capacity for self supported multi day trips, Henry and Foster stretched the Outrage by adding a foot and the Outrage X was born. Same wave as above. The Outrage X is one foot longer. The soft chines allow me to side surf without a brace. The soft chines of both boats make them very forgiving for beginning and intermediate paddlers. While they still carve well, the soft chine gives a very easy transition when carving. This is enhanced by the shallow arch bottom and the relatively narrow beam. Those give good speed when trying to attain surf waves. It does come at a price. 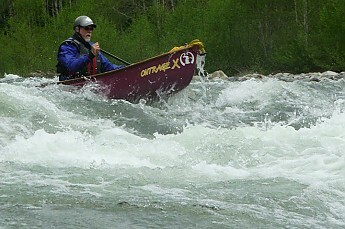 The arched bottom does not surf as well as a flatter bottom boat would, such as an Ocoee or a Blast. The rocker on these boats begins nearly at the center of these fish form asymmetrical designs. That makes the Outrage and Outrage X drier than some other boats like the Mohawk Probe series. The Outrages also spin fast because of the extreme rocker. Before I bought my Outrage X, I had paddled a lot of boats. Every designer is trying to achieve a compromise by drawing a boat that will perform well for a particular paddler over a variety of different conditions. There is no perfect boat or boat that will do everything. I had paddled Impulses, Prophets, Probes and Ocoees. Many in our club favor the Probes, well built boats in a family of lengths. The Prophet and Impulse I found to be dry and spun well, but were bigger than what I wanted, and slow. I found myself pointing at surf waves, but completely knackered by the time I got on the wave. Ocoees are great boats that carve well and surf well. But their hard chines made them a bit too twitchy for me. The Probes I found to be able to surf well, but the wide beam that added stability also made cross forward strokes difficult. I am not small at 5’11 and 185 pounds, but have a long torso and relatively short arms, so I wanted a boat in which my cross forward strokes were easily managed. After an extensive search, I bought a used Outrage X that had been through several owners and had apparently started life as a demo boat. Though worn in spots, the hull was still solid, and the outfitting was basic but serviceable. Outfitting a play boat is something that is very personal. Many in the East, particularly in Canada, like a type of outfitting that locks the knees and thighs in with a rigid plastic or foam section across the front of the saddle. Here in the West, fabric thigh straps are the norm. Although my boat came with basic outfitting of foam saddle, thigh straps and foot cups, I fitted the boat to my personal style and size. 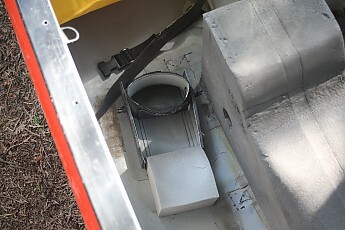 I left the saddle where it was, but removed the foot cups and placed them near the turns of the bilge at an angle. While some paddlers like their legs straight and along the sides of the saddle, I find this contorts my knees uncomfortably. I also added another set of adjustable anchors for the thigh straps to be able to move the outer attachment points further forward. Because I like my toes to stay awake, I added foam ankle blocks. All of my outfitting came from Northwater, but the Outrage X and Outrage can be outfitted with gear from Mike Yee or Beluga, the latter being an example of the East Coast style I mentioned previously. The last thing I added, were new air bags as the ones the boat came with, were probably originals. A note about outfitting any canoe or kayak. Inches, even fractions and angles make a difference, not just in feeling “at one” with the boat, but also for decreasing fatigue. 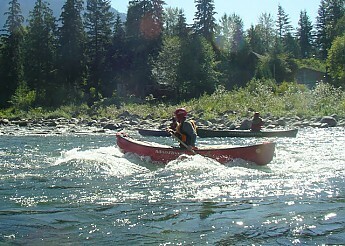 A canoe or kayak, in this way, is no different than sizing a pack or bicycle to your own body type and shape. First off, the Outrage and Outrage X have a lot of rocker. They are shaped like bananas. 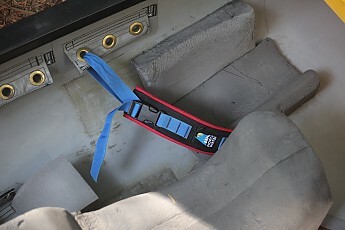 This helps the boats turn, but also keeps them dry in bigger waves. Something else that is obvious is the shouldered tumblehome. This is on the sides of the boat where the designers kept a lot of beam for stability, but just below the gunnel brought that beam in abruptly so it was easier to have a vertical paddle stroke. Black Vinyl gunnels and polypropylene decks complete the package. New boats come without outfitting of any kind, just a bare hull, decks, gunnels and two ash thwarts. These boats, especially the X, are not light. My Outrage X weighs close to sixty pounds with outfitting installed. But this weight repays the paddler with stability and some glide, and the boat owner with ruggedness. I have hit many rocks over the years, and bumped down more than a few boney creeks and the vinyl skin is still not worn through. When I purchased a new Outrage several years ago, I noticed that it was considerably lighter than my X, more than the one foot length difference would suggest. In a conversation in 2011 with Dana Henry, Jim’s son, he mentioned that builders are always changing the thickness of the layers and reinforcement on Royalex canoes in an effort to find the perfect combination of light weight and durability. An interesting note is that Dana Henry now designs canoes for Wenonah, and his father, who sold his interest in Mad River Canoes more than twenty years ago, is now back with Mad River. Father and son, both designing canoes for competing builders. It must make for interesting family get-togethers. Getting into the Outrage X, or any canoe, for that matter, is the same. 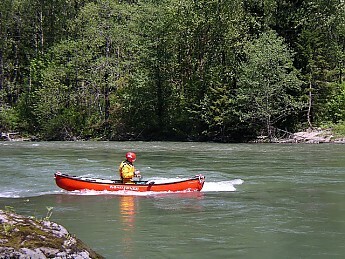 Grasp both gunnels with even weight, preferably with your paddle locked by your thumbs, step into the boat evenly with your feet on the inside bottom, and lower into the seat or saddle. Stability is quite good, even with the narrow gunnels and extreme rocker. With the first forward stroke, the Outrage X accelerates quickly, despite its weight. Tracking (straight line stability) is not good as one would expect from a boat with such extreme rocker. True with any white water boat, as they are made for turning, not going straight. Your strokes reflect this. Rather than use a “J” stroke to steer (finishing with your thumb up) you follow your forward stroke with a stern pry. The pry, though less efficient than a “J”, is a more powerful correction stroke. And it is necessary because without it, a forward stroke turns the canoe as much as it propels it forward. In more quiet water, such as pools between drops, the Outrage X can be induced to track better by tilting the boat to nearly the gunnel. This allows the chine to act as a keel of sorts. 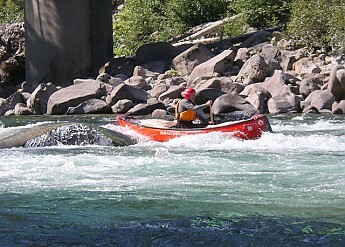 In whitewater playboats, the effect of a stern pry after the forward stroke, does straighten the canoe’s course out, but it also slows it down. this is why a cross forward stroke is used. On the Outrage and Outrage X, cross forward strokes with a vertical catch are easier because of the boat’s narrow beam and shouldered tumblehome. Grabbing eddies in the boat are a joy, as the boat carves well. With good balance, eddying out can be done without using your paddle. Just enter and tilt the boat and the differential current and the boat do the rest. As I mentioned earlier, there are advantages to the hull design for attaining a surf wave and sustaining it. Getting to a wave is easier than many other solo play boats I’ve paddled because the Outrage X and the Outrage are both fast boats. However, the narrow bottom with its gentle arch doesn’t surf as easily. In a situation where a flatter hull like a Mohawk Probe 12 might easily surf on the smallest wave, the Outrage X will not. If the wave is big enough, it will easily surf, and no paddle surfing is possible with the right wave, with corrections accomplished with slight tilts or leans. On large waves, the extreme rocker and the high ends, keep the boat dry during a front surf with no need to lean backwards. This same hull shape helps when punching large waves. This is an advantage over the Probes, boats where I have buried the bow and nearly cart wheeled on the wave when surfing. Side surfing is also possible in the Outrage X and Outrage, and their soft chines are not as catchy as some other boats with more abrupt transition at the turn of the bilge. Large wave trains are a joy in the Outrage X and Outrage. 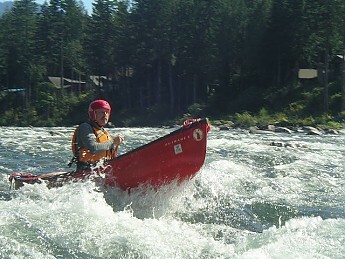 If you want to stay dry, such as a long rapid, you needn’t paddle hard except when it is necessary to punch a hole. And the full bow deflects waves well. The rapid acceleration of the hull form is also a benefit here as that last second need to get through a looming hole has saved my bacon a number of times. Width at 4" waterline: 27.25"
Weight without outfitting: 53 lbs. Since the early 1960s I have hiked, climbed, skied and paddled over much of the Northwestern part of North America. In the early 1990s I retired from more extreme mountaineering and now spend a large portion of each year canoeing Canada’s Far North. An additional paddler’s note: I didn’t start off as a white water playboat junkie. While it is true that I took a couple of canoe trips in my youth, I was primarily a hiker and climber in the warmer months and a skier in the winter months. But the birth of my son changed that, as I wanted him to experience the natural lands and I didn’t have to ability to take him, most of his gear and all of mine, on longer adventures. The canoe was the obvious choice to allow that. The capacity allows one to carry gear for several weeks or months, including light hiking gear for multi day side trips. I also wanted to paddle the wild rivers of Canada’s North, a dream I had in my youth. 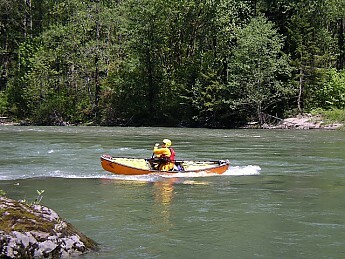 While many northern rivers can have mellow sections, most have sections of at least Class 2 and often Class 3 rapids. This requires the ability to read and run rapids in heavily laden tripping canoes. To acquire these skills requires practice in safe environments. Eventually, I added white water playboating to my list of outdoor pursuits. Looks like you really put it to the test, Erich! Great review and cool action shots! Thank you Daniel. Like other products I review, I tend to use them to the fullest so I can give an honest assessment based on a depth of experience. I've had my Outrage X for seven years and paddle it about 20 days a year on average. Great review Erich!...I love it when a review teaches as well as informs...and what a great boat! The Outrage X has been discontinued. 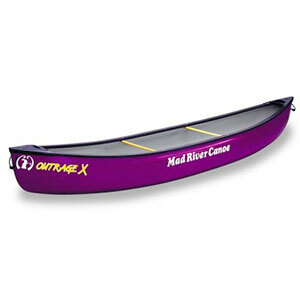 The Mad River Outrage X is not available from the stores we monitor.